Last 2 performances in Melbourne coming up! There are two more performances coming up this month in Melbourne before i depart Australia. Both events are organized under the moniker Gentle Steps with an Open Mouth, organized by artist Alice Hui-Sheng. 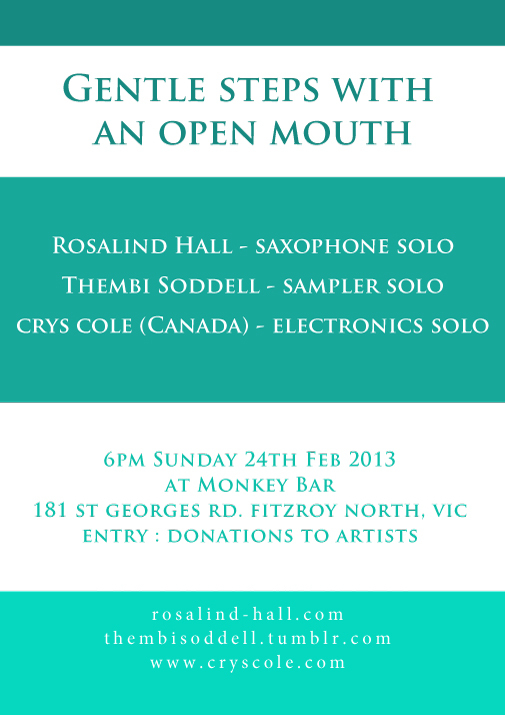 The first will be a solo performance on Sunday, September 24 at a lovely little space called Monkey Bar alongside solo performances by Aussie artists Thembi Soddell and Rosalind Hall . The second performance will be a series of improvisations with Alice Hui-Sheng (voice), Nigel Brown (modified accordion) and Anthea Caddy (cello). This event will take place on September 28 at Westspace. 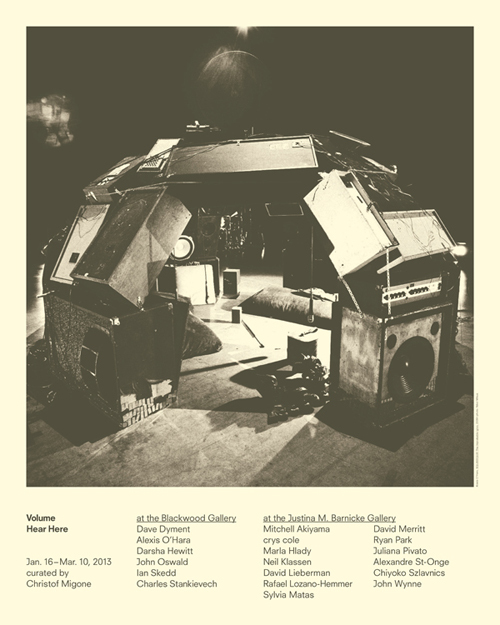 I am very pleased to have my piece sweeper included in the wonderfully curated exhibition Volume: Hear Here in Toronto. The exhibition is running currently through until March 10 in two galleries, Justina M. Barnicke and the Blackwood Gallery, and is curated by brilliant artist and curator Christof Migone. Running alongside the exhibition are a series of artist talks, panel discussions, performances and a book launch. All details are up here. My work is presented at Justina M. Barnicke alongside artists Sylvia Mattas, John Wynne, Marla Hlady, Alexandre St-Onge, Chiyoko Szlavnics and many more.